Free Norton Security Scan Antivirus scans for viruses and spyware that damage your computer. Free Norton and Spyware Doctor are Not a Trial or Shareware; they are free antivirus and can coexist with other antivirus software. You can now have greater virus protection! The software installs in minutes and can schedule virus scans for your PC. 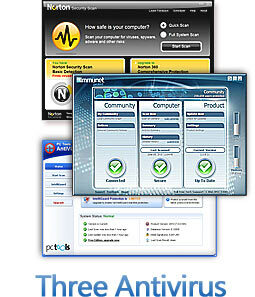 Unlike anti virus and antispyware software installed with Dell or Hp computers, with these free antivirus and Spyware Doctor versions there are no annual subscription fees. You can use this free antivirus and antispyware protection for the life of your PC! Schedules scans for your computer and downloads virus updates. Can’t Find What your Looking For? Get other Free Downloads and Read our Unbiased Reviews. Panda Antivirus 2011 incorporates several new technologies that will help your computer be more safe. One of Panda Antivirus's key features is its always on scanning technology. If your visiting a website or receiving an instant message, all of the incoming data will be checked for malicious software and or malicious intentions. This scanning technology is often found in corporate antivirus. In contrast, most regular pc antivirus software will only scan files that are already downloaded on to your computer. The next feature that Panda Antivirus offers is advanced heuristic protection. I have discussed heuristics before, but what it essentially does is attempt to detect viruses without actually knowing what the virus is. Therefore, heuristic protection gives a computer additional protection against virus threats that haven't even been discovered. Panda Antivirus takes this protection one step further by offering Genetic Heuristic and Truprevent protection. These technologies constantly monitor your computer for new viruses, trojans, and spyware. Panda Antivirus Internet Security also offers an advanced firewall and computer backup capabilities. Free Panda Cloud Antivirus – Free Panda Cloud Antivirus Download. Panda Free Online Scan – this antivirus free online scan can detect and delete viruses. A firewall prevents unsolicited communication to and from your computer. Sometimes a virus, spyware, worm, or a trojan (a virus that allows other people to control your computer) might automatically install on your Windows XP or Vista computer. A firewall will detect these malicious programs installation and prevent them from communicating to the hacker who might want to control your PC. Free Zone Alarm is probably the easiest most established firewall software to use. Another great firewall is Comodo Free personal firewall. The company is fairly new in the firewall software scene. However, the software has won PC Magazine’s editor choice. I have seen the software recommended all over the web. I would definitely also give it a look. Click Here to download free Zone Alarm software. Basic Security Completed. Read More Below for the Best Security! If you downloaded Free Full Norton Antivirus, Free Full Spyware Doctor, and Free Zone Alarm you have successfully made your Windows PC more secure. Great Job! You can now feel more confident about the safety of your computer and your personal online transactions. Just remember to use FireFox when browsing the web! To start, always click on the fire logo with a fox on your desktop. If you have already downloaded Free Norton Antivirus and Spyware Doctor, these extra advanced computer security tips will help keep your windows pc even more secure! Also check below for more Windows Security Tips. Take a comprehensive strategy to your computers security. Download multiple free antispyware software solutions in addition to Free Spyware Doctor (downloaded in the first step) such as Adaware, CounterSpy, and Webroot SpySweeper. The key point is having multiple spyware and antivirus software because each company discovers different spyware or trojans at different times. If you have many free software products and regularly run scans, you can significantly decrease your chances of being susceptible to new threats. Webroot Spyware Sweeper – known for its extensive spyware definitions and is frequently used by corporate companies. CounterSpy (Now Vipre Antivirus) – another popular spyware program used in higher education institutions. Consider the same strategy in the last tip for antivirus. Keep one antivirus solution installed on your computer (like Norton Security Scan / Norton Antivirus download) but use other company’s free online virus scans and antivirus to supplement your computer's antivirus installed on your computer. Popular free online scan services will also significantly decrease your computers vulnerability to new virus threats. Online Scanner Directory – another useful website that lists all of the free online anti virus and anti spyware scanners available. Free AVG Antivirus – if you haven't downloaded Norton Antivirus or Spyware Doctor consider Free AVG. This will need to be installed on your computer. This software also has accurate scans. These anti virus and anti spyware scans are awesome services. Say that you get a file attachment from a foreign email sender. You download this file attachment and anti virus scan the file. Although no virus or spyware was found with the one companies anti virus software, there still maybe a virus. If this is a critical system, consider using a service like Jotti’s malware scan. (Again this is a really cool service) Jotti’s scan will scan your uploaded email attachment or file with 21 anti virus companies software! This service will ensure you the best possible protection against a malware attachment because as stated before anti virus companies discover viruses at different times. Although Jotti’s has a lot of positive features, unfortunately it only allows a 10 megabyte uploaded file limit. But the good news, it is still a very valuable service. Jotti’s Online Virus Scan– a great service to scan and ensure a file or attachment’s safety.